There are 400,000 Ahmadiyya Muslims in Indonesia, among a population of 260 million people. 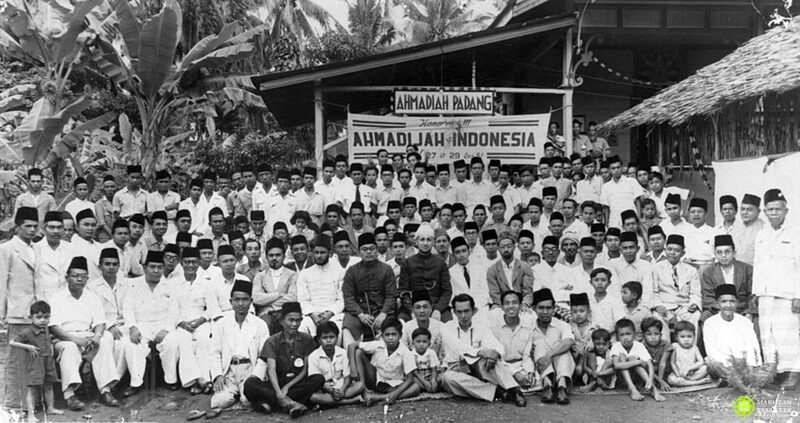 What is the history of the Ahmadi believers in Indonesia? What are their differences with Sunni Muslims? And how have they been affected by religious repression in recent times? This article provides a brief introduction to these questions, from an Ahmadi perspective. Two decades before the Indonesian National Revolution (1945), when Indonesia was still under Dutch colonial rule, the then-second Caliph of the Ahmadiyya Muslim Community, Hazrat Mirza Bashiruddin Mahmood Ahmad, sent a missionary to Indonesia from India. This missionary was Imam Rahmat Ali. He arrived in 1925 and was welcomed into the greater Indonesian community. The Ahmadiyya Muslim Community was thus formally established in Indonesia, and it rapidly grew. Imam Ali’s preaching was inspired by the Prophet of Islam, Muhammad, and by the desire to revive Islam and reunite Muslims. Under the leadership of the second Caliph, the Ahmadiyya community was rapidly growing worldwide. While its adherents, the Ahmadis, have recently faced persecution in Indonesia, for most of the time since the community was established in the country over 90 years ago, it has enjoyed a healthy relationship with the government and the people. This was no accident. 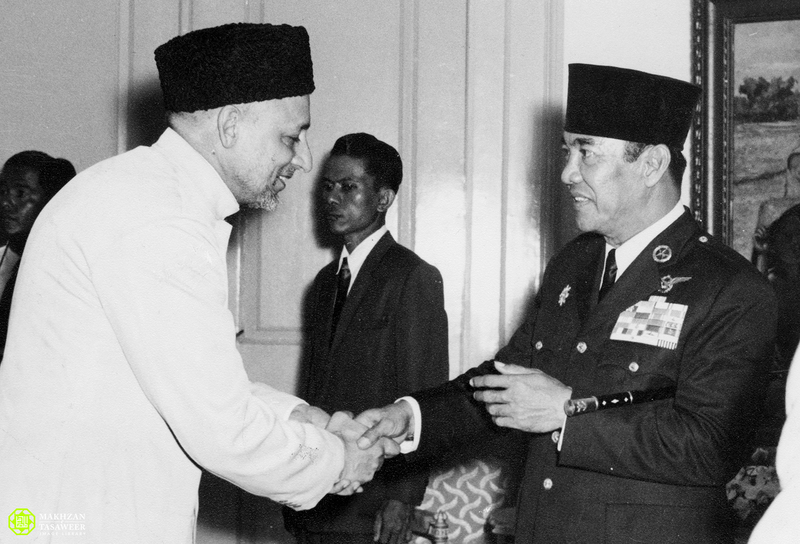 To the Ahmadi Muslims, Indonesia’s first President Sukarno was a dear friend. While Sukarno was a political prisoner in Indonesia during the Second World War, his cellmate was an Ahmadi missionary named Imam Ahmad Nurudin. After World War II ended and both were released, a healthy and fruitful friendship ensued that helped strengthen Indonesia domestically, and internationally with India and Pakistan. Years later Sukarno would write, “To Ahmadiyah I shall be grateful… there are books from Ahmadiyah that I got a lot of benefit from.” He even welcomed Ahmadi Muslim Imams to the presidential palace as state guests. Under his leadership, Indonesia and its citizens prospered—including those who joined the Ahmadiyya Muslim Community. Likewise, Ahmadi Muslims have always been grateful to the country of Indonesia and its people. Today, despite the recent growing hostilities and persecution against Ahmadi Muslims, there are some 400,000 Ahmadi Muslims in Indonesia. There is also a Jamia Ahmadiyya in the country—a seven-year seminary that trains Islamic scholars according to the Qur’an, Sunnah, hadith, and the writings of the Promised Messiah and Mahdi, Hazrat Mirza Ghulam Ahmad (as) of Qadian. These Indonesian Ahmadi Muslim scholars have in turn continued to serve in Indonesia and throughout the region to convey Islam in its true message of peace, love, and service to humanity. Many ask how the beliefs of Ahmadi Muslims differ from those of Sunni Muslims, who currently make up the majority of Indonesian Muslims, or how we interpret the Qur’an differently. Critics launch numerous meritless allegations against us claiming Ahmadi Muslims have a new Scripture besides the Qur’an, perform Hajj elsewhere besides Mecca, or do not accept Prophet Muhammad as the Seal of the Prophets. However, people are surprised to learn that not only are such allegations wholly false, but that in reality, there is only one difference in theological beliefs between Ahmadi Muslims and Sunni Muslims. Hudhayfa said: ‘Allah’s Messenger (pbuh) said, ‘[My] nabūwwah (prophethood) shall remain among you as Allah wills it to remain, and then Allah shall cause it to end when He wills to end it. Then will remain Prophetic Caliphate (khilāfah ‘alā minhājin nabūwwah) and it will end. Then shall come despotic monarchy (mulkan ‘ādhdan) and it will end. Then will appear coercive monarchy (mulkan jabrīyyah) and it will end. Then will appear Prophetic Caliphate (khilāfah ‘alā minhājin nabūwwah) again. Then the Prophet (ﷺ) remained silent.” (Musnad Ahmad ibn Hanbal, Awwal Musnad al-Kūfiyyīn, Vol. 4, #273). Prophet Muhammad perfectly described what the Muslim ummah (community) has suffered through during the preceding 1,400 years leading up to today. A khilafat was established on the precepts of Muhammad’s Prophethood, but it came to an end and despotic monarchical rule took place. In the Muslim world today, from Iraq to Syria, from Saudi Arabia to Egypt, we see that coercive monarchical rule dominates. Prophet Muhammad’s prophecy continues, stating that just as a khilafat would establish after his own Prophethood, it would also, later, re-establish on the precepts of a future prophethood. All Muslims agree that Muhammad was a Prophet, that khilafat was established after him, and that despotic rule then followed and exists to this day. The difference between Ahmadi and Sunni Muslims pertains to the subject of the identity of the Messiah and Mahdi who will re-establish the khilafat. Many or most Sunni Muslims believe that the prophet Jesus (Isa), son of Mary, physically ascended to heaven, and that he will physically return to bring about Islam’s victory. They believe that a prophet sent to the Tribes of Israel shall come to save the Muslims. By contrast, Ahmadi Muslims believe, based on the Qur’an and hadith, that Jesus, son of Mary, was a prophet sent to the Jews only. We believe that Jesus died a natural death at an old age , as all prophets of God die, and that he will not physically return. We believe that Hazrat Mirza Ghulam Ahmad (as), a Muslim follower of Muhammad (sa), was elevated to the status of Messiah and Mahdi by Allah’s grace, and he has been sent to revive Islam and reform and reunite Muslims under the institution of Khilafat-e-Ahmadiyya. The scholarship supporting the Ahmadi view is readily available for all to read, but unfortunately it is banned by many anti-Ahmadi clerics. There is no other substantive difference of belief between the Ahmadi and Sunni schools. Ahmadi Muslims recite the same kalima taught by Prophet Muhammad (sa), “There is no god but Allah and Muhammad (sa) is His messenger.” We believe in the five pillars of Islam and the six articles of faith. We believe that Prophet Muhammad (sa) is Khaatam-al-nabiyyin and the Seal of the Prophets, that Islam is the final religion, and the Qur’an is the final book. Ahmadi Muslims fully accept the books of hadith and the Rightly Guided Caliphs who succeeded Prophet Muhammad (sa). Indeed, Ahmadi Muslims are united worldwide in 212 countries under one Khalifa, in accordance with another prophecy of Prophet Muhammad (sa), that a khilafat would be re-established in the latter days, and that it would reunite Muslims. The Ahmadiyya Khilafat was established in 1908, after the sad demise of Mirza Ghulam Ahmad (as), the Messiah and Mahdi, and continues unbroken to this day. The current fifth Khalifa is Hazrat Mirza Masroor Ahmad. 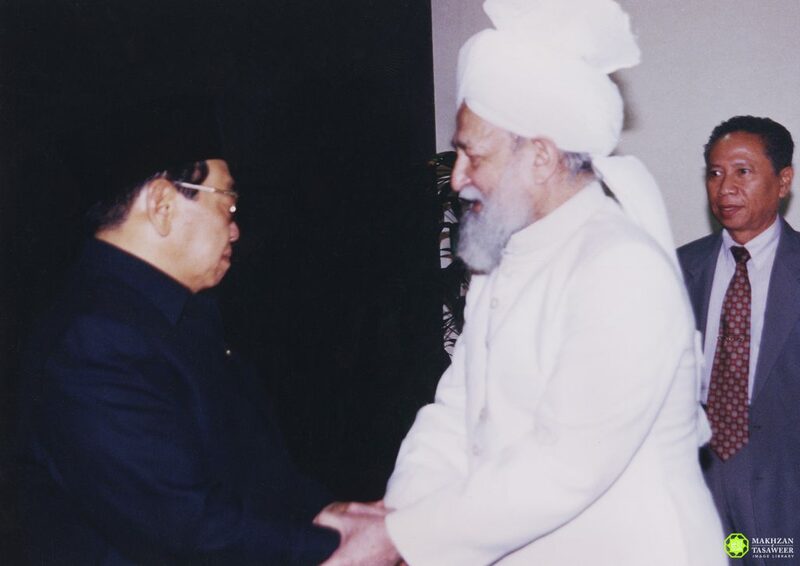 The previous Khalifa, Hazrat Mirza Tahir Ahmad (1928-2003) even visited Indonesia personally. Indonesians have a long history of tolerance and harmony. Indonesia’s proud motto is Bhinneka Tunggal Ika—out of many, one. Yet persecution of Ahmadi Muslims has increased since the early 2000s across Indonesia as part of a wider trend towards religious intolerance generally. The first 80 years of Ahmadi Muslims living in Indonesia passed peacefully—we were even recognised by the government in 1953–so why the recent change? Article 156: The person who publicly gives expression to feelings of hostility, hatred or contempt against one or more groups of the population of Indonesia, shall be punished by a maximum imprisonment of four years or a maximum fine of three hundred rupiahs. Article 156a: By a maximum imprisonment of five years shall be punished any person who deliberately in public gives expression to feelings or commits an act. with the intention to prevent a person to adhere to any religion based on the belief of the allmighty [sic] God. Initially, this law was generally applied to prevent intentional provocations of public disorder, and “stem the recognition of indigenous beliefs” across the archipelago. With the creation of the Indonesian Ulema Council (MUI), Indonesia’s top Muslim clerical body, in 1975, the law was used more frequently to persecute and discriminate against religious minorities. Numerous regional branches of the MUI have released fatwas on the issue of “deviance” from mainstream Islam, including recommendations to ban the Ahmadiyya. These have been influential in enabling continued official and social discrimination against the Ahmadiyya and other minority religious groups. The “deviance,” as the Sunni-dominated MUI describes it, is that we Ahmadi Muslims believe the awaited Messiah and Mahdi has come. Indeed, that is their only argument and that is precisely the argument the Meccan chiefs made against our master Prophet Muhammad (sa). They could not disprove him, they could only ridicule him for forsaking the beliefs of their forefathers. Ahmadi Muslims respond as Prophet Muhammad (sa) responded, that Allah has provided guidance, and we are peacefully following that guidance. As an example of the MUI’s influence, the Indonesian government approved MUI fatwas in 2005 and 2007, that respectively banned and condemned the Ahmadiyya Muslim Community. A 2008 government joint ministerial decree banned the Ahmadiyya Muslim Community from proselytising, on pain of a five-year prison term for blasphemy. A government body, the Coordinating Board for Monitoring Mystical Beliefs in Society, unsuccessfully supported a full ban, but Ahmadi Muslims remain allowed to worship in private and vigilantism against them is specifically forbidden. Nevertheless, the Government has tolerated violent abuse and discrimination towards Indonesian citizens belonging to the community. The New York Timesreports that vigilante attacks against Ahmadi Muslims have increased each year since the ban’s implementation. The Setara Institute, an Indonesian religious liberties organisation, recorded 15 attacks on Ahmadi Muslims in 2008, 33 in 2009, and 50 in 2010. The Setara Institute also documents increased attacks through 2016 by another non-state actor—The Islamic Defenders Front (FPI)—against Indonesian Ahmadi Muslims and Christians. From 2008 to 2018, there have been 155 documented attacks across 10 provinces on Ahmadi Muslims in Indonesia. Given the rise of attacks against the Ahmadi community in Indonesia in recent years, it seems clear that the MUI’s use of fatwas and inflammatory language has promoted hatred against Ahmadi Muslims. The enforcement of Indonesia’s anti-blasphemy laws are denying Ahmadi Muslims the free expression of their beliefs. Under the guise of maintaining peace and order, such enforcement has resulted in a dramatic and consistent increase in religious violence. Yet, as deeply entrenched as they are, these discriminatory laws can be redressed. With a proper understanding of the situation and a unified international effort, Indonesia can be held accountable to fully comply with the International Covenant on Civil and Political Rights (to which it is party), and can restore itself as the democracy it is known for throughout the world. Unfortunately, Indonesia is not a lone example. Ahmadi Muslims face persecution in numerous Muslim-majority nations—but never because of any violence or discord caused by Ahmadi Muslims. Since our inception in 1889, the Ahmadiyya community has spread to 212 nations and has tens of millions of members—and they have lived peacefully with their neighbours without a single act of religious extremism. World leaders have recognised the plural and peaceful nature of the Ahmadi Muslims, with praise coming from President Sukarno, Arab leaders, Canada’s Prime Minister Stephen Harper and UK politician Jack Straw, as well as various US members of Congress. Ahmadi Muslims are helping thousands of Rohingya refugees, Muslims in Gaza and Syrian refugees. Likewise, we are building hundreds of schools and hospitals to provide education and healthcare to all people regardless of faith—because this is the perfect model of Islam that Prophet Muhammad (sa) taught. To this end, the Ahmadiyya Muslim Community has established Humanity First, an international non-profit disaster relief organisation that serves humanity worldwide whenever they are in need. Ahmadi Muslims are also apolitical, so we do not trouble ourselves with worldly power. Individual Ahmadi Muslims are encouraged to vote when they can (in Pakistan, they are banned from voting), or even run for office, but they do so in their individual capacities. The Khilafat of Jamaat-e-Ahmadiyya in Islam relies only on Allah for support and sustenance and the community accepts money only from members of the community. No other person, entity, or government is permitted to donate. However, Ahmadi Muslims are heavily persecuted in Pakistan, Algeria, Malaysia, and in almost every Arab state. The average Indonesian can help stop the persecution of Ahmadis by holding fast to the principle of Bhinneka Tunggal Ika and realising that Ahmadi Muslims are part of the fabric of Indonesia as equal citizens. Differences in theological interpretation cannot permit violence, terrorism or persecution. Such acts are wholly un-Islamic and unjust, and Indonesians should rise above them. This means voting for candidates who promote universal religious freedom for all people regardless of faith. It means rejecting ulama and clerics who incite violence and hatred against those with whom they disagree. And this means having the courage to push past the censorship and learn about what Ahmadi Muslims believe, from Ahmadi Muslims themselves. Just as we would not want those unaware of Islam to learn about it from anti-Muslim extremists, it is unwise and inappropriate to learn about the Ahmadiyya interpretation of Islam from those who are extremists or hateful of Ahmadi Muslims. The key to understanding the Ahmadiyya Muslim community is through education. Thus, when Allah the Almighty is the Provider and Sustainer of all people and Gracious, Ever-Merciful, how could it be that He desired for those who believed in Him to mercilessly murder, violently oppose or harm His Creation in any way? Of course the answer is that it is not possible. Nonetheless, Allah the Almighty has certainly permitted for action to be taken to stop cruelty, inhumanity and injustice. Islam states that a Muslim should seek to stop the hand of an oppressor and to end all forms of injustice and transgression.